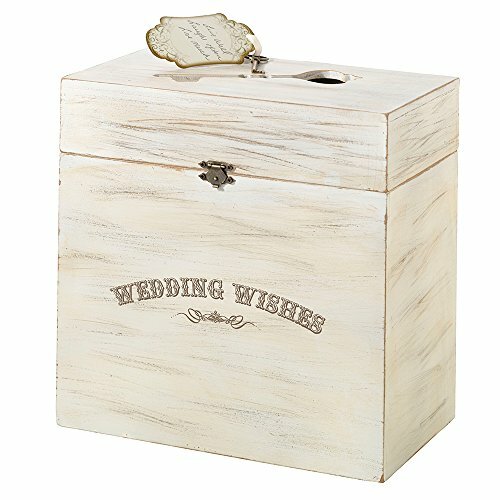 Lillian Rose White Wood Wedding Wishes Key Card Box. Family and friends can share their wedding wishes in this attractive key card box for the wedding reception. It has a metal latch for securing the cover and a unique key shaped opening on the top. This keepsake will make a lovely decoration in the home. It measures 10" x 10" x 5.25" and has "Wedding Wishes" on the front. Measures 10" x 10" x 5.25"
View More In Card Boxes. If you have any questions about this product by Lillian Rose, contact us by completing and submitting the form below. If you are looking for a specif part number, please include it with your message.